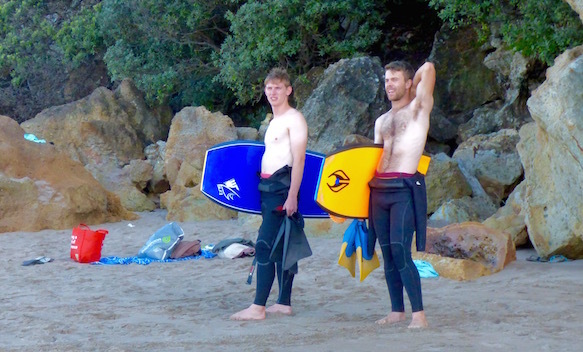 “Go to Hot Water Beach at low tide,” advised Scott Cook in his New Zealand Frenzy North Island guidebook. Lucky us! Not only did we time our arrival near low tide,‘twas shortly before sunset on a splendidly sunny autumn day, the bathing the beach in a glorious golden glow. 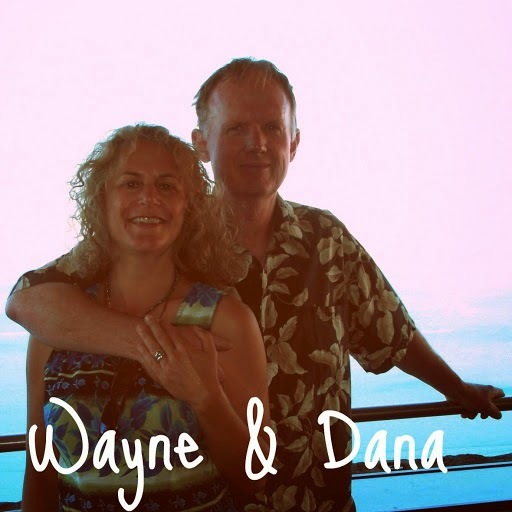 Wayne wanders down the beach toward the masses to check out Hot Water Beach’s natural spas. of thermal activity, here in the form of an underwater hot spring. We were not alone in our appreciation of the beach. Hot Water Beach, especially since we were there on warm Easter weekend, was crowded* with folks there to bask in its famous, hot spring heated waters. 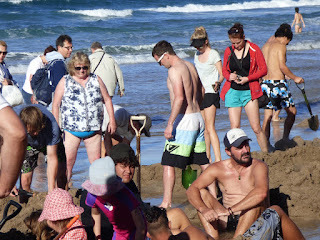 I didn’t take count, but easily, at least 100 folks frolicked, settling happily into the warm water-filled sandy pits. *Wikipedia notes Hot Water Beach attracts 700,000 annual visitors annually! 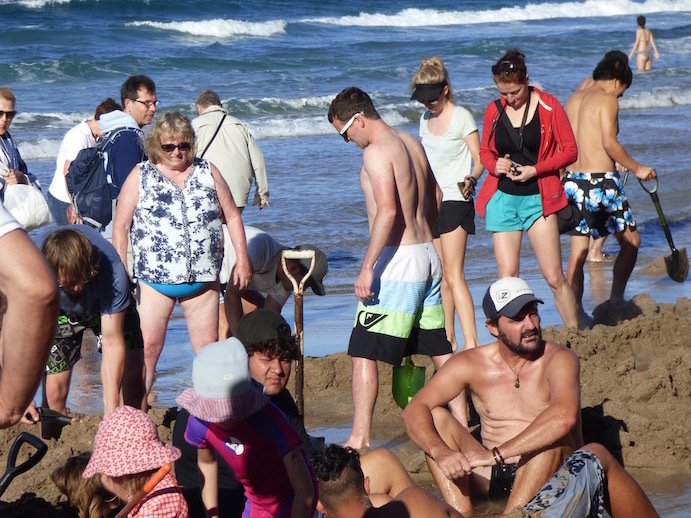 Hot Water Beach is wonderful melting pot, literally and figuratively. I’d probably savored Hot Water Beach more if we hadn’t spent the better part of our day driving there. 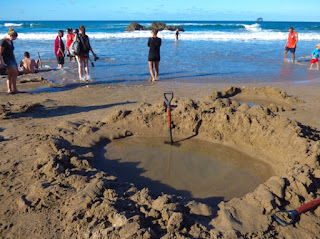 My sense is the best way to make the most of Hot Water Beach is to explore the area earlier, wear a swimsuit, bring a shovel (rent, if you don’t have one), and know ahead of time where you’ll enjoy a hot, soapy, de-sanding shower after. Still, after hearing so much about it since arriving in New Zealand months earlier, it was nice to finally check it out. The hitchhiker we gave a ride in planned to camp on the beach. We’d heard that campers get rousted from there. Considering what a wonderful place Hot Water Beach would be to take in the sunrise and sunset without having to leave in between, I envied him for giving it a try. Unsure of where we’d be sleeping that night and because we weren’t in our swimsuits, Wayne and I were content to watch, rather than step into the natural saunas. We didn’t want to get to sandy or salty in case we spent the eve in our tent, in sleeping bags, without a proper rinse. to share the beauty of the place with his young daughter. Before long, we sped off, in search of place to lay our heads before darkness fell. 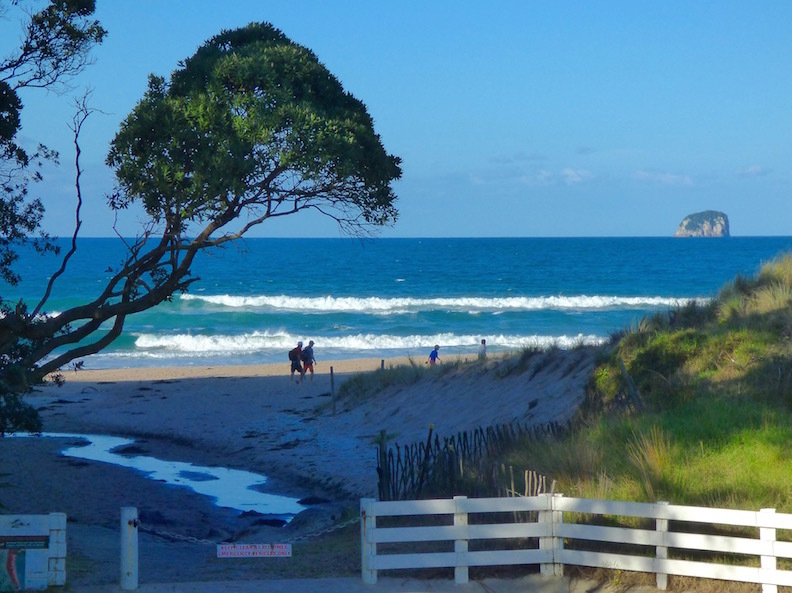 We ended up at not that far from Hot Water Beach, at Hahei Holiday Resort. There, we opted for a slightly more cush set-up, bypassing their campsite for the warmth and convenience of one of their 4-person bunk dorms just across from their backpacker lodge communal kitchen and shower, We even had wifi! Hahei Holiday Resort was a good pick and was only about ½ hour away from Hot Water Beach. 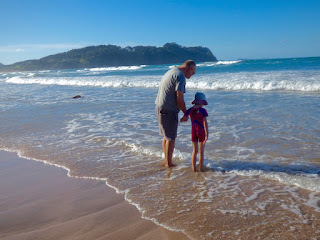 It offered the closest affordable lodgings to Cathedral Cove, which we planned to visit first thing the next morning. More on Cathedral Cove in my next post. As for Hot Water Beach, happy as I was to see what all the fuss was about, I wouldn’t make a special trip to Coromandel for Hot Springs Beach, but it’s certainly worth seeing if you can fit it in especially if the weather is nice and the tide is low. However, if the novelty of a free ocean spa with a few hundred strangers on a beautiful stretch of beach tickles your fancy, check out Hot Water Beach. 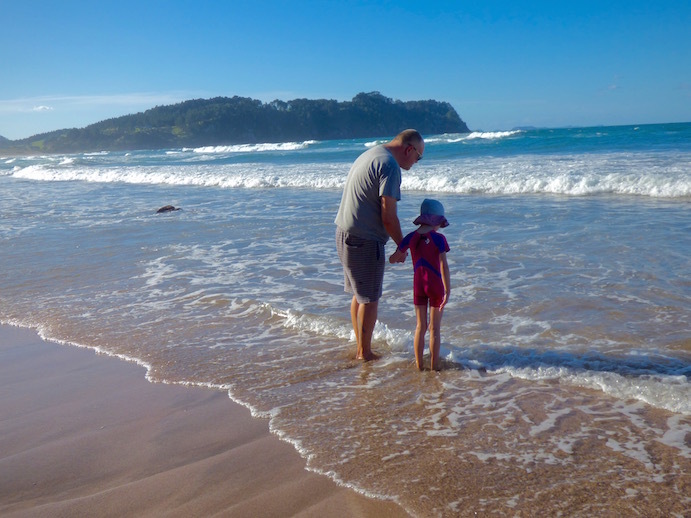 For us, overall, Coromandel Peninsula is a place we’d love to return to and spend more time, whether we stop at Hot Water Beach or not. Scenery bonus for the Galley Wench, buff boogie board boys. Tonight we're anchored at Whangaruru (S35.21.945 E174.21.480) at the fringe of the Bay of Islands, though still in New Zealand, waiting for a better weather window to our first major cruising stop this year, to Fiji. 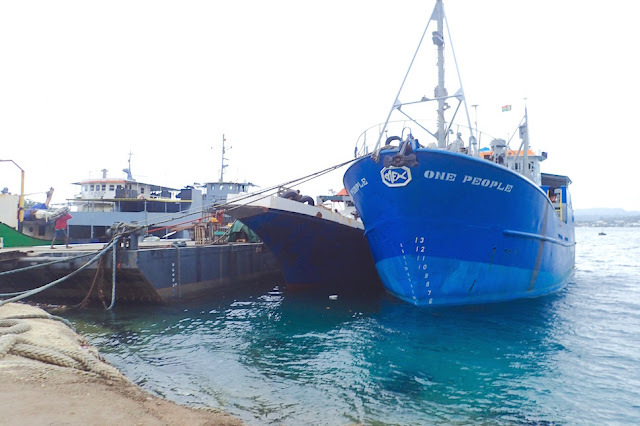 Once we clear New Zealand customs (probably May 10th, from Opua, Bay of Islands - where we first arrived in New Zealand in November) and set sail, it will take us nearly two weeks to get to Fiji, at 1170 nm, our 2nd longest ever passage.